We put a plank across the stream to use as a bridge. For my father, his old-fashioned morals were a plank to cling to in the sea of the modern world. This policy is the main plank of the party's election campaign. The builders are planking the floor. 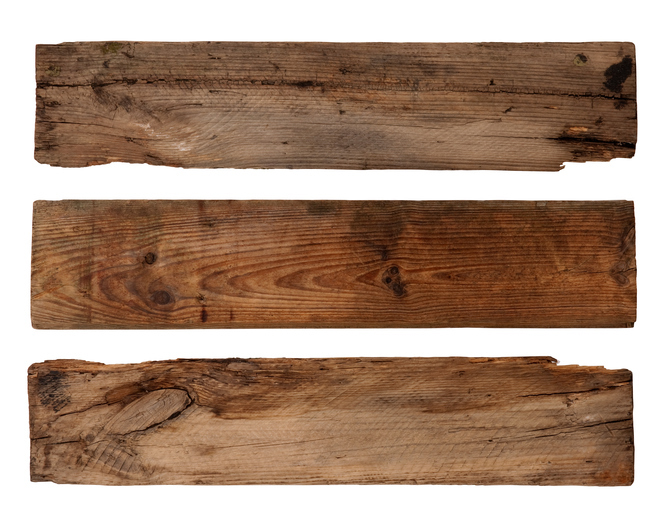 Plank dates back to the late 13th century or the very early 14th century. The Middle English noun planke came into the language from the Old North French planke, a variant of the Old French planche (a plank, slab or small wooden bridge). It can be traced back to the Late Latin planca (plank, board or broad slab), which probably evolved from the Latin plancus (flat or, when talking about a person, flat-footed), from the Proto-Indo-European root plak– or plāk– (to be flat), from the PIE root pele- (‘to spread’ or ‘flat’). Plank is related to the French planche (plank), the Spanish plancha or planchador (an iron), and placa (plate or slab), the Italian plancia (bridge or gangplank), the German Planke, and many English words, including flag, flake, fluke, plagiarism, flaw, floe, airplane, explain, piano, plain, plane, plasma, plastic and even the country name Poland. In technical terms, a plank made of wood, can be 2 to 7 inches thick, and is at least 9 inches wide and 8 feet long, though of course this definition matters mostly to carpenters and builders. The political sense dates back to the mid-19th century, and was first used in the US. The verb comes from the noun, and has been used since the mid-17th century. The expression ‘to walk the plank,’ which we usually attribute to pirates, was actually first used by slave traders in the late 18th century.